Spectacular color changes paint the landscape every fall, especially in the State of Virginia! Take the time to take an RV fall foliage vacation in the Blue Ridge Mountains. You’ll be treated to fall colors against the beautiful backdrop of the mountains and valleys that were home to our founding fathers. Starting in the Shenandoah Valley, just 20 miles from downtown Staunton lies the entrance to both the Blue Ridge Parkway and Skyline Drive. These scenic routes make for a great driving tour offering scenic overlooks with breathtaking mountain views ideal for photo ops and picnics. They also provide access to a number of the area’s most popular hiking destinations for all ages and abilities. From Skyline Drive try Blackrock Summit, a geological wonder that’s an easy 1-mile loop. From the summit of boulder-strewn Blackrock enjoy views that extend for miles in multiple directions. But that is not your only choice for driving to see the beautiful leaves changing. Here is a list of other options around Virginia you may consider. Find Your Passion Along the Blue Ridge Mountains. AutumnSplendor in the Cabin Capital of Virginia. Follow the Apple Trail this Fallin Winchester. From the Bridge to the Ridge. For more information about these wonderful visual treats, visit the Virginia website here. Virginia offers a host of different options for camping with your RV. The Virginia State Parks, voted “America’s Best,” have campgrounds in 28 of its parks. They’re open the first Friday in March until the first Monday in December. Virginia also has a range of National Parks and National Forests to choose from. Check out Shenandoah National Park, which is open for primitive back country camping, if that is your style. Also, about 549 miles of the Appalachian Trail runs through Virginia; 107 miles of it is in Shenandoah National Park. The trail here is well-maintained, excellent for beginning hikers. Enjoy an abundance of wildlife and beautiful mountain vistas. Many folks camp in the woodlands off the trail. Prince William Forest Park features tent and RV camping for six campers per site at its Oak Ridge Campground, which is open all year. Travel Trailer Village is for RVs only, and Turkey Run Ridge Group Campground is for seven or more campers per group. George Washington & Jefferson National Forests flow together along the Appalachian Mountains in Virginia. About 2,000 miles of hiking trails, including 330 miles of the Appalachian Trail, are major attractions, as well as lakes, ponds and streams for swimming, boating and fishing galore! See their website here for more information. Enjoy the spectacle of fall foliage from the comfort of your RV. To rent an RV for the Fall Leaves Spectacular, visit either of our rv rental locations at Baltimore or Louisville. Plan to stop and visit some historic places along your way or on your return. 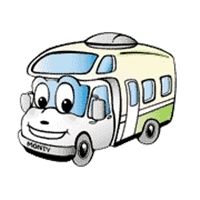 You can also rent an El Monte RV at one of these locations and return it to the other if you have time for a longer trip. What could be more fun than coming together for a weekend of good food, good music and outdoor festival camaraderie? RV camping at festivals adds an additional layer of enjoyment to multi-day festivities. Whether you’re camping right in the heart of festival action or at a comfortable campground nearby, the convenience and affordability of festival camping make it a favorite activity of RV travelers. We’ve picked two special festivals for you to consider for this year’s camping itinerary—and both take place the first week in May! From smokin’ hot blues in Memphis to a luscious celebration of South Carolina strawberries, they’re both good reasons to reserve an RV rental and plan your own Southern festival weekend. If you love the experience of small-town festivals, where local elementary school choirs take the same stage as regional country-rock bands and well-known blues artists, you’ll want to turn your RV toward Fort Mill, SC this May. Charlotte, NC, is home to the annual South Carolina Strawberry Festival that honors the sweet red fruit that comes ripe right as this festival begins. There are festival-related events like a pageant and golf tournament the week prior to Festival Weekend, but the action really starts to get sweet on Friday, May 5 and Saturday, May 6, 2017. Home-spun fun such as shortcake and hot wing eating contests and a ring-full of professional wrestlers raising funds to fight cancer will keep RVers plenty occupied. That’s even before we mention the musical talent that takes the Strawberry Jam Stage both Friday night and all day Saturday. There’s even a Strawberry Pancake Breakfast Saturday morning at the local high school. And it’s all within easy reach, as most festival events take place in or near the town’s Walter Elisha Park. Camp Wilderness at Carowinds Amusement Park, fifteen minutes north of the Festival grounds. Why not plan to stay and play at Carowinds to round out your South Carolina family RV camping vacation? Charlotte/Fort Mill KOA, just off I-77 and less than ten minutes from Walter Elisha Park, gets high marks from RV travelers. Crown Cove RV Park on the North Carolina/South Carolina border, minutes from Fort Mill, is another highly-recommended campground close to the Festival. Our next festival takes us to Memphis, home of blues, barbeque and sassy Southern hospitality. Each May, more than one hundred thousand music lovers congregate on the banks of the Mississippi at Tom Lee Park in Memphis to enjoy musicians as varied as Snoop Dogg to Drive-By Truckers. The 2017 Beale Street Music Festival will be held May 5-7 and promises to be one of the best reasons to travel to Memphis by RV this year. Bonus Memphis RV camping idea: While RV camping in Memphis to attend the Beale Street Music Festival, while not schedule a longer stay to enjoy the other Memphis in May International Festival events? Kicking off with the Beale Street Music Festival the first weekend in May and stretching to the 901Fest in late May that celebrates all the 901 (Memphis) area code has to offer, this quartet of Memphis festivals in May will tempt RVers to linger longer. It’s time to start planning your festival RV camping experiences! Use these ideas as a springboard to make your 2017 festival camping plans, and don’t forget—we’re here to help you have your best RV travel experience yet. Three serene, unspoiled rivers and two picturesque lakes in southern Virginia are the path to take for days of paddling on the Southern Virginia Wild Blueway. Mix in attractive RV campgrounds all along your route and this Virginia camping and paddling trip can become one of your best vacations yet. If you’ve never paddled a kayak or canoe here, it’s high time you did! Pack the RV and your favorite watercraft and use these tips to plan your own trip down the Southern Virginia Wild Blueway. Don’t own an RV? Be sure to get in touch for an RV rental—we’ve got you covered. With more than one hundred miles of waterways to explore on this Blueway, you have plenty of choices for where to put in, how far to paddle and where to camp. The Staunton (Roanoke), Dan and Banister Rivers tempt paddlers with wooded shores, man-made and natural features and plenty of wildlife. These rivers all flow into John H Kerr Reservoir, also known as Buggs Island Lake, which straddles the Virginia/North Carolina border. State park campgrounds all along the lakeshore make it possible to stay and explore Virginia’s largest lake awhile. But you’ll want to float the Blueway farther south along the state line, as well, to where Lake Gaston offers its own special charm. To explore the Staunton River leg of the Blueway, put in at Long Island Park in Long Island, VA, slip around the Hale Islands and paddle downstream eleven miles to the Brookneal boat launch. You’ll find Class I and II rapids during peak flow and a nicely wooded shoreline. Primitive campsites are available in Long Island Park. is surrounded by wooded trails and features standard electric campsites. One more suggested river trip—the Bannister River from the King’s Bridge access point on the outskirts of Halifax, VA about seven miles downstream to the Terry’s Bridge takeout point at US-360. The route’s made more interesting by man-made rapids created by wing dams, and the scenery is surprisingly unspoiled, despite nearby towns. You’re close enough to camp at Staunton River State Park on this route, as well. The two lakes on the Southern Virginia Wild Blueway give paddling enthusiasts even more opportunities to explore. Occoneechee State Park on Kerr Reservoir (Buggs Island Lake) features standard electric campsites right on the lakeshore, close enough to Clarksville to make a quick trip for supplies. The reservoir’s eight-hundred-fifty-miles of shoreline includes secluded coves accessible at points like Longwood Park (a nice campground here, too) and Island Creek Park. Fish, paddle or hike until you’re ready to move on; it’s an outdoor playground worth getting to know. Kerr Tailrace Park is your access to the waters of the Roanoke (Staunton) River as they flow once again toward Lake Gaston. The area is rich with wildlife, in particular bald eagles, osprey and great blue herons who come to feed below the dam. Camping is available just down the shoreline within the large campground at North Bend Park. And we can’t leave the Southern Virginia Wild Blueway without offering a peek at Lake Gaston. After you’ve explored the Kerr Tailrace/Bugg Island waters, venture downstream at least as far as the Steel Bridge or Flat Creek access points for a taste of the Blueway’s southern limits. Lake Gaston is more highly-developed than Kerr Reservoir, but you’ll still find plenty of places to paddle. As you do, you’ll be close enough to camp at North Bend Park again, or you can enjoy all the amenities of a full-service RV campground at Lake Gaston Americamps. If you love to explore scenic waterways by kayak or canoe, you can’t beat the more than one-hundred-miles of adventure on the Southern Virginia Wild Blueway. With convenient, friendly campgrounds the entire way, there’s no reason not to add this trip to your ‘gotta do it’ camping and paddling vacation list.